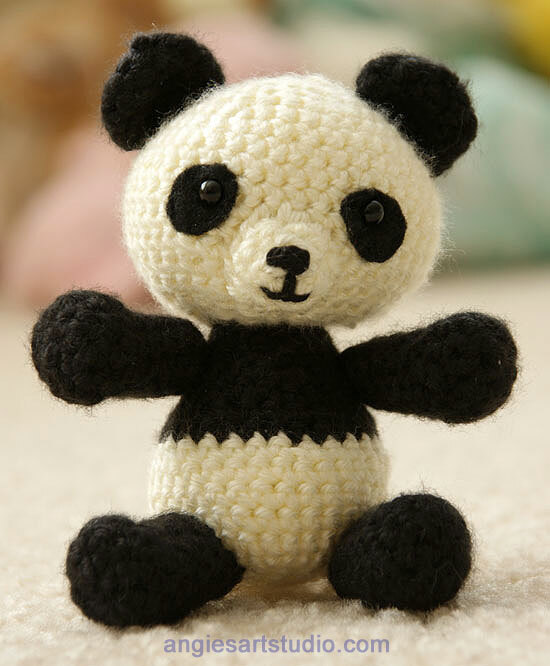 Panda Bear Amigurumi Crochet Pattern – Free! 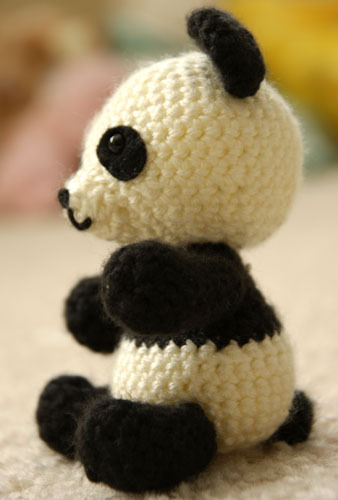 This amigurumi pattern designed by me gives instructions on how to crochet Pablo the Playful Panda. It is very easy to crochet and only requires knowledge of 3 crochet stitches – single crochet, increase and decrease. Pablo means small and humble in Spanish and his finished size is about 5″ (12 cm) high. He is certainly small and humble like his name suggests, but he is oh so playful! FREE PDF download link is at the end of this post. Yarn: any Worsted Weight 4 ply yarn is fine. To change color of the yarn, begin the single crochet with the first color. This should leave you with two loops on your hook. Now grab the second color with the hook and pull it through both loops to complete the stitch. Now continue the next single crochet in the second color. Off White yarn. Start with Chain 2. R4: SC 2 (2) Yes, that’s right, this row only has 2 stitches and should finish off at the top of the muzzle. Fasten off leaving a 10 inch (25 cm) tail for sewing on to head. Because the muzzle is so small, instead of stuffing with poly-fil, I use left over bits of off white yarn. Sew on nose and mouth with black yarn. Insert eyes through the patches of felt by cutting a tiny slit in the felt. Place into position on the head and sew patches onto the head. Fasten on the safety backings. R17: SC in each ST (12) Fasten off and stuff with poly:fil. R4: as above (12) Fasten off, leave a 6 inch (15 cm) tail for sewing onto head, flatten the ears so that they are in the shape of a half circle and two layers thick, no need to stuff with poly-fil. R16: as above (15) Fasten off, leaving a 10 inch (25 cm) tail for sewing onto head, stuff with poly-fil. Black yarn. Start with Chain 2. R6 to R9: as above (9) Fasten off, leaving a 9 inch (20 cm) tail for sewing onto body, stuff with poly-fil. R6 to R8: as above (10) Fasten off, leaving a 9 inch (20 cm) tail for sewing onto body, stuff with poly-fil. R3: SC in each ST (8) Fasten off leaving a 6 inch (15 cm ) tail for sewing onto the back of the body. No need to stuff with poly-fil. Pin the parts in place and sew together with a yarn needle. Click here for the free PDF! Very fun pattern. I changed the starting ch’s and used the magic circle to start. and I modified the ears as well an made them flat instead of folded over. I also sewed on the limbs before stuffing . came out great. so cute. I love your pattern , thank you so much for sharing. Can you please explain to me how I can make it a little bigger. Thank you. HI Alice – to increase any amigurumi pattern you can use thicker yarn (can use a double strand) and a bigger hook. To make it smaller, use thinner yarn and smaller hook. Hope this helps you. All you need to do to make a project bigger is use a larger hook. But I wouldn’t go any larger than an I hook ,without changing the yarn as well. usually this is when it starts to get into higher ply yarn ( thicker) or holding 2 pieces at once. Also too much bigger would probably need a change in pattern because you would need quite a few more rows of sc in each all the way around n some of the other rows may be doubled . So basically, I would think larger than an I hook ,you may need a revised pattern. I’m late for everything . Probably be late to my own funeral . Well ,maybe my comment will help someone else. Hopefully, and I agree, thank you for the pattern ,it’s very well written and easy to work up . 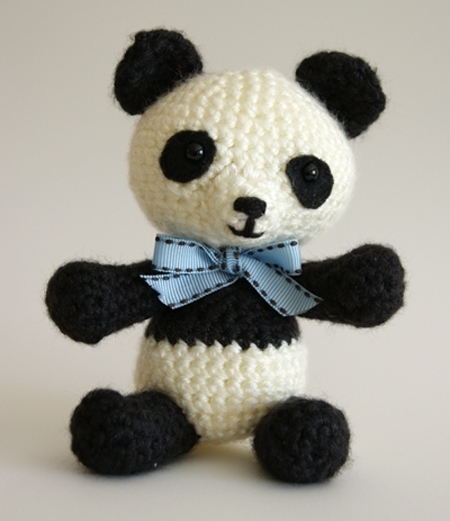 I made this Panda with black and white cotton yarn for my friend. She loves Panda’s. I also crochet a tiny hat and scarf for it. To bad I don’t have a photo! Thank you for having this pattern free! I am in the process of stuffing and sewing all the parts. This was super easy and fun to make. This is so cute and adorable. Thanjs for sharing. This is my first amigurumi project. I needed this panda pattern very badly. Hi, in your round 3 of ears, you say “as above” but in round 2 you say “INC in each stitch.” Following these instructions would result in 24 stitches in round 3. I believe this is the trouble the person above was having. This pattern is very awesome besides that. I really enjoyed making it. I used black and white cotton yarn. He turned out really cute. Thank you for giving this pattern away for free!!! Thank you very much this adorable pattern! You’re welcome Eva and your panda turned out really cute! Very cute one . Thanks for sharing . i just love it ! thanks for the pattern ! You saved my Christmas by offering this Panda pattern for free. 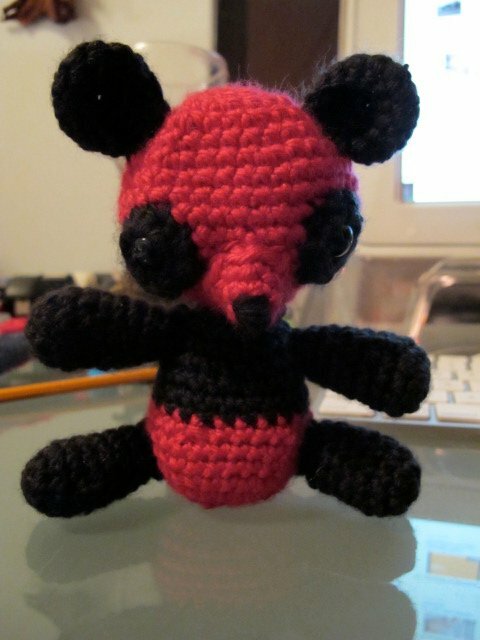 I’m making it for my daughter who loves pandas. You pattern is one of the best i have seen. Thank you. Dear Angie, thank you for the pattern! My doubt – are the rounds worked continuously or by joining (sl st)? the rounds are continuous, do not join with a slip stitch. what difference will it be if I used a 3.5mm hook instead of a 4? Stitches will just be a little tighter. I don’t think there will be much of a difference. Angie, thanks. Love pandas. I have about 20 great grandchildren to make a pandas for. trick. Furthermore, The contents are masterwork. you’ve performed a magnificent job in this topic! a mimicked ADHD problem through the day hours. I’m fairly new to crochet so I do not understand these instructions at all! They are so confusing. Your pattern is adorable. But I am having trouble with the ears. Is there a correction? Thanks Connie! I’m really glad to hear that and I love the play on words! I hope P AND A will enjoy their amigurumi pandas. Thanks so much for the pattern. Most amiguri pandas are a little scary looking, but yours is delightful. I am making them for my TTTS twin grand-nieces who are 1 yr. old. Payton AND Addison. (P AND A)! Hi.. I’m just starting with crochet, hoping you can send me this pattern. Thank you so much for the awesome and free pattern!! I was able to make a great gift for my nephew with it! I have a pic of it, but don’t know how to post it :-( Anyway, thanks again! 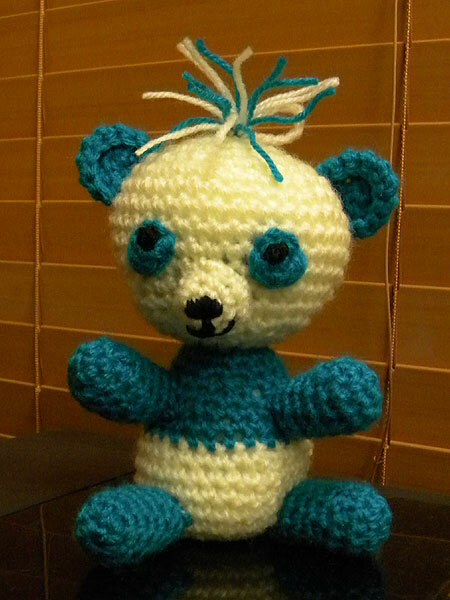 I think the bear is so cute I can hardly wait to make him. i love this pattern it was quick and easy to follow. i made one for my friend because she loves pandas. It came out great and she loves it. Hi! I am very very new to crocheting and I have only seen “inc 1” in instructions. What does “inc 2” mean? Is it much different from “inc 1”? Thanks! “inc 2” means to increase the next 2 stitches. Hope that makes sense! Thanks for your free pattern. Hi, i totally loved yr pattern…. and want to try it out… however i am very very new to crochet and am learning and just picking up stuff… is there a way/pictures wherein i can see and follow how to make this… maybe like a tutorial… because since i am new there are lots of terms that i misunderstand… thanks for the help!!! Hi Shalini! Thanks for your message! You can try this Youtube tutorial, I found it helpful when starting out myself. It takes a while to get used to the terms in the written pattern, but you will get the hang of it the more you do it. Hope this helps and let me know if there is anything in particular about the pattern that you don’t understand. I’d love the pattern!! He’s so super cute!! I’ve just finished my first crochet amigurumi (bunny) and he could be next! Wendy, Your Blue Panda is soooo very cute – love the tuft of hair! Thanks for sending a picture of it! did you use the instructions for the ears or make up your own ? very nice. Thank you so much for sharing this adorable pattern. I love pandas, so I just had to make it. I am relatively new to crochet, so this was my first non-scarf project. It turned out wonderfully. I’m going to send you a picture! You’re welcome Sandy! Glad to hear that you like how your Panda turned out, I look forward to seeing the picture! I was interested in this design but was curious as to what the * signify in the instructions. Could anyone let me know what they mean? The * symbol means to repeat what is between the *’s the number of times stated. Thanks for the pic Marisa! 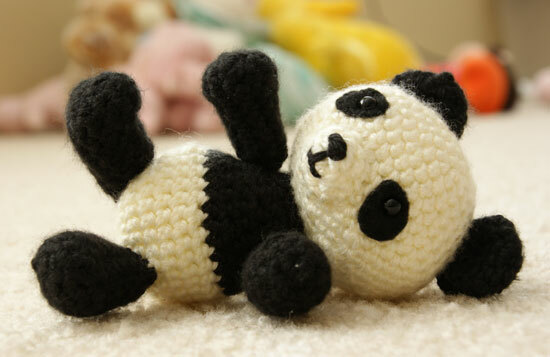 I love your pink and black Panda – pretty good for your first amigurumi! This website contains affiliate links. If you click on them and complete a purchase, a commission may be earned. © Copyright 2019 Angie's Art Studio. All Rights Reserved.